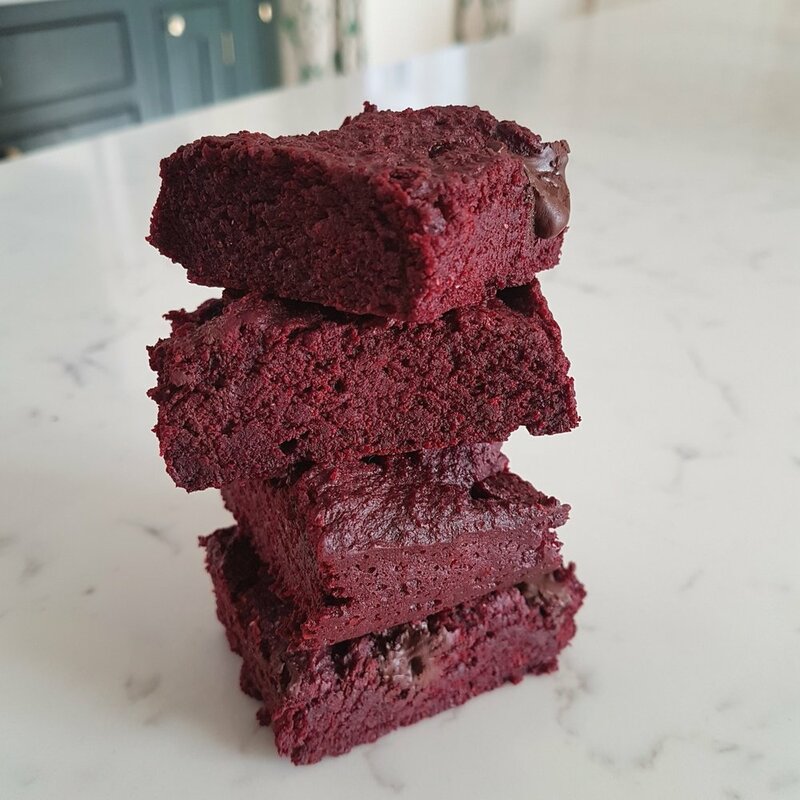 These brownies really are more beetroot than chocolate so I have given the option to top up the natural sugar content if you need! You can see by the incredibly vibrant colour how beet heavy these are and therefore packed with antioxidants. I have also suggested leaving the skins on the beetroots and poaching for a shorter time so that the fibre content is left intact. These are suitable for vegans and for those gluten, dairy and refined sugar free. 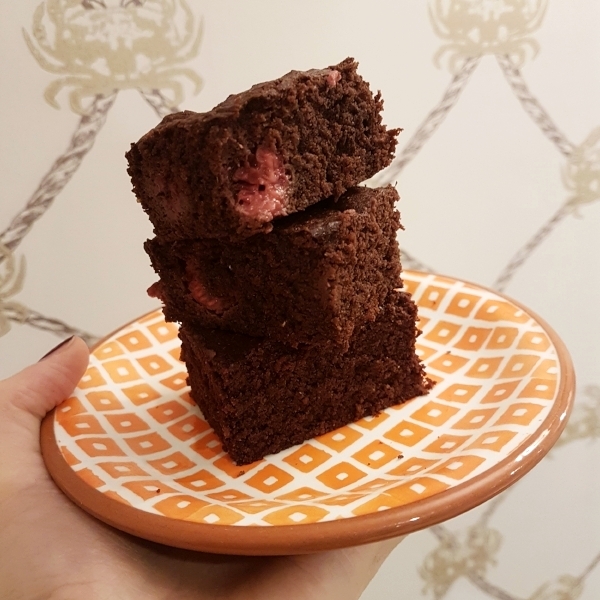 Ingredients for 20 brownies: x4 fresh raw beetroots, 100g of buckwheat flour (or another if you prefer), tablespoon of GF baking powder, 100ml of coconut oil, 100g of organic dark chocolate, tablespoon of raw cacao powder & vanilla paste plus 50ml of maple syrup. Method: Line a baking tin with baking paper, preheat oven to 180 degrees and melt dark chocolate with coconut oil in a small saucepan. Clean and trim beetroots, taking off any really thick bits of skin. Cover with water and poach for 20 mins until only just tender. Remove, roughly chop and add to blender or magimix with other wet ingredients - coconut oil, maple syrup, vanilla & melted dark chocolate. Blitz and taste this beetroot mix, it is at this point that you may like to add more maple syrup or chocolate - you need to enjoy the taste at this stage! Add swiftly to your dry ingredients, don’t over work and pour into your lined tin. I like to add some cheeky cubes of extra dark chocolate to the top of the mix but equally you could make a chocolate glaze, bake for 25 mins. Such a simple chocolate treat with the benefit of fibre and natural fats. You can interchange nuts for seeds if you are nut free and use quinoa pops instead of amaranth. Line a small oven dish with baking paper. Meanwhile add a handful of the two nuts to a frying pan and lightly toast for 10 mins. Break the dark chocolate into pieces and place in a mixing bowl over a saucepan of simmering water, stir till melted, adding the cinnamon and take off the heat. You can now combine all the dry ingredients with the chocolate, stirring so that everything is really well coated and press a 6 cm layer into your oven dish and place in the fridge for a couple of hours. So simple. Cut into rectangular bars, store these in tupperware, and keep in the fridge - they will last for over a week but I assure you will be gone within days!! For the compote: 8 conference pears, handful of golden raisins & juice plus zest of 2 clementines. Method: simply mix all these ingredients together in a cereal bowl, making sure there is a little fluid resting over the top of the dry ingredients so that the oats and chia seeds can expand. Put in the fridge overnight. Meanwhile skin the pears and chop, add to a saucepan with the zest and juice of the clementines, as well as the golden raisins. Poach slowly until just tender. This is enough for quite a few servings so I like to freeze little batches that can be used for puddings and breakfasts whenever you need. To serve start with half a bowl of bircher museli and top with the compote. You could lightly toast some extra hazlenuts to finish and add honey, but it really is sweet enough. Vanilla oat & chia porridge with stewed fruit: cook oats in a milk of your choice (we used cashew milk) and add a big spoon of vanilla paste for natural sweetness. You could also soak them overnight but cooking breaks oats down further to remove any phytic acid - in much the same way as we activate or sprout grains and nuts. Leave to cool whist you soak chia seeds in the same milk and vanilla, you may also want to add ground cinnamon and/or ground ginger for taste. Once the chia seeds have absorbed the liquid you can combine both together and either eat or set aside in the fridge for breakfast the next day. I have not put exact amounts as you may want some for a few days - it will keep in the fridge for three. On to the fruit: We used blueberries and I simply slow cooked them in a saucepan after rinsing them thoroughly (remember how much our fruit is sprayed!) and add the zest of a lemon and dash of honey. Once jammy they are ready and you can add to your porridge - great at this time of year, in the Autumn you might want to add stewed apples, pears or blackberries. You could of course add raw fruits of your choice but for the purpose of this workshop we were looking at ways in which to calm the body and mind and eating slowly cooked foods is one of the ways to achieve this, leaving the digestive system very little to do. So far we have carbs, protein, vitamins, minerals, natural sugars - let's now add some more fats and fibre to offset the fructose, keeping blood sugar stable, with a simple granola that does not even require any cooking! In a bowl put puffed quinoa and/or puffed amaranth and stir through vanilla paste, dried berries, coconut chips, fresh pistachios, pumpkin and sunflower seeds. Add to a kilner jar to keep fresh for a week or so. You could add linseed if you know you need more fibre - remember we are all different. Praline nuts: you all loved the sweet pistachios so just a very quick recipe. Pop a handful of nuts in a small frying pan with some unrefined brown sugar or coconut sugar, once the heat has just melted the sugar take the pan of the heat and bring together with a wooden spoon and bash up once cool in a pestle and mortar. Don't panic if you find they cool and stick firm in the frying pan, just warm up again and move once soft! You can choose any nut or nut and seed combination you fancy and store for topping on anything in an old jam jar. Enjoy this balanced, calming breakfast to start the day. It's lovely to enjoy a warming bowl of porridge on a cold day but we don't always have the time or maybe we want to take breakfast with us to work? by making overnight oats you can have something ready in the fridge for up to three days to which you can add an array of fruit, nut butters and seeds. For this version crush cardamom seeds to a fine dust in a pestle and mortar. Add to oats and chia seeds with a little vanilla powder and pour over your choice of milk. Keep stirring and adding milk until the seeds have expanded. I have used coconut drink from M&S because it has a mild coconut taste which marries with the tropical taste of mango. If you are using berries almond milk goes well and with apple compote hazelnut milk. Mango is finely chopped with the juice and zest of a lime. Once ready to assemble together just layer up in a glass and top with pistachios and linseeds that have been heated in a pan with coconut or brown sugar. I also use the flat plate on the nutri bullet to break them down to a nut crumb, this combo of nuts and seeds adds both natural fats and fibre to your breakfast. So simple and such a crowd pleaser with even the smallest members of the family. Pop 1/4 bag of frozen berries in the nutri bullet cup or food processor, add the juice of 1 blood orange (as they are in season) and a mug of milk, I like brown rice milk with this. Blend to your desired consistency, for little kids you could make it really thick and add a drop of honey as a great refined sugar free pudding! Many of you mentioned you have a little craving for something sweet so try taking pecans and fennel seeds, warming in a fry pan with honey and leave to cool. These will keep in an airtight container for a few days. You could also try cashews in the same way with curry powder and honey. I have been tweaking a recipe based originally on a brownie by Anna Jones. This version uses a fraction of the coconut sugar, and to reduce the amount of ground almonds, introduces organic wholemeal self raising flour to give lift and lightness, which my kids and their friends love. Pre-heat the oven to 170C fan and line a small baking tin (20cm by 10cm) with baking paper. To make sure it fits just scrunch up into a tiny ball and unfold - a Jamie Oliver trick! Melt the butter and chocolate in a bowl over simmering water. Take the bowl from the heat and stir in the coconut sugar followed by the eggs, well beaten, and add gradually as you fold in the mixture. Next up, mix in the flour and almonds, along with the vanilla, finally stir in the raspberries and bake in the middle of the over for 30 to 40 minutes. Ovens vary so look for a little rise and a very slightly cracked top. Leave to cool before cutting up and storing in an air tight container. Share & enjoy - we love them! Ayurveda, the medicine sister of Yoga, is one of the most ancient and powerful mind-body health systems in the world. It is a complex system but over the years I have found I return to and dip into aspects again and again for myself, family and clients. One of the principles is simply the importance of breakfast, lunch and supper, which reduces the need to snack. Skipping meals is a big no no for me and many others - confusing blood sugar and increasing feelings of anxiety. We fuel healthy bodies and minds with wholesome meals, our kids and teens need to do the same, something I feel passionate about. When was the last time you heard your tummy rumble? smelt food that made you salivate? felt truly excited and READY to eat? Be honest with yourself. Too many of us fall into the snack trap. Forget breakfast, snack later instead, not hungry enough for a good lunch so another quick snack and so on? thus putting a constant stress on the digestive system that remains on the go all day and can lead to weight gain. When the tummy rumbles it is not telling you to eat necessarily but that the stomach has emptied and grinding (that's the noise) the last dregs down to the large intestine for further filtering and processing. Now comes the slightly controversial part of this post, and some will deeply disagree with me, but that's cool. It's about our kids. How many of you bring a snack in the car at pick up? When I ask, most Mums tell me that their kids could not possibly go without the car snack on the way back from school as they are starving, the kids word, not theirs! Ask them why and the answer is always the same, they don't eat school lunch - let's go back to why? they know you are going to give them a delicious snack in the car!! 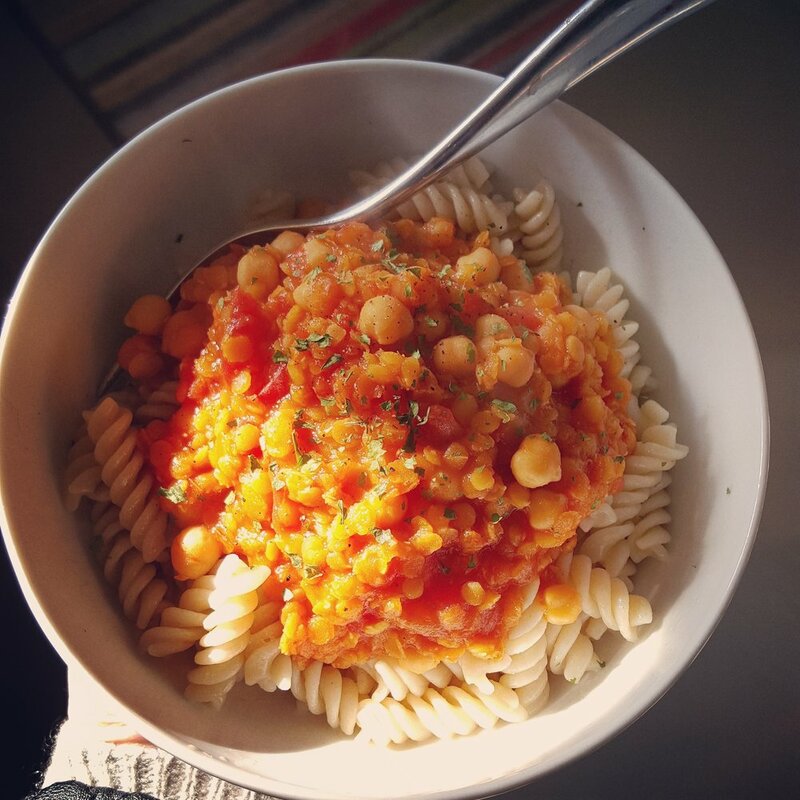 So they love their snack (and I am sure it is healthy, but that's not the point), and then you make a lovely supper, and guess what, their stomach is still working so they don't 'feel' hungry and your supper goes to waste. Let's make 2018 the year of eating well, making food together (here is my earlier post about helping fussy kids to be better eaters) and saying a big thank you to our school catering staff. Let's make a money jar for every time our kids use the word starving and send it to Save the Children - it's heartbreaking that there are children who really do know what it feels like.